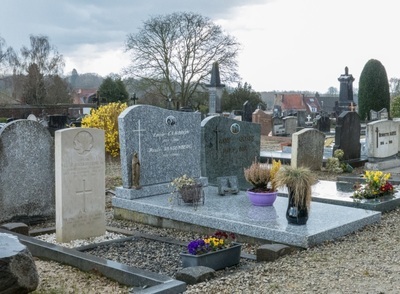 The village of La Hulpe is situated to the south of Brussels off the ring R0 which runs between Brussels and Waterloo. From the ring R0 heading in the direction of Waterloo take the first exit off after the junction with the E411/A4. Come up to the T junction and turn left toward Hoeilaart, then take the first right turn and cross over the railway. At the T junction turn left onto Terhulpensesteenweg and follow this road into the village of La Hulpe. On entering the village take the second turn left after the water, this is called rue Eugene Castaigne, then take the second turn left called rue des Deportes and the cemetery is at the end. 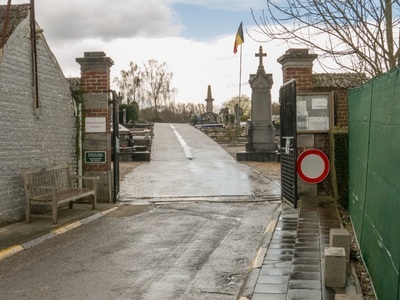 The World War II graves are located at the left hand side of the entrance and can be seen on entering the cemetery. for the World War I grave you have to walk further along the main path and turn left up the second path. At the end of this path turn left and the war grave is the seventh on the left. 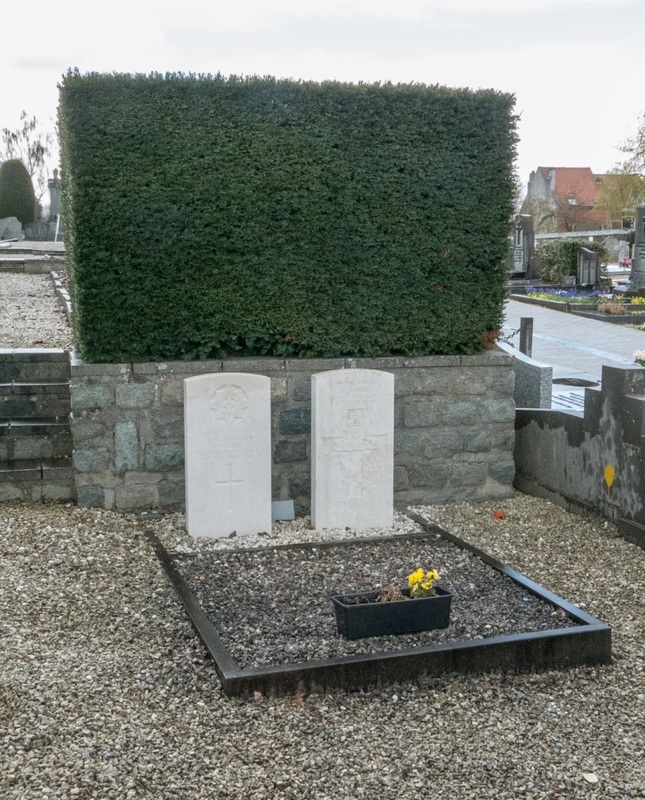 La Hulpe Communal Cemetery contains two Commonwealth burials of the Second World War. The single First World War casualty buried in the cemetery died after the Armistice. GPS Co-ordinates N 50. 44 .00. E 4. 29. 15. Captain William Macleod Moore M. C. Regimental Depot, (Sakatchewan). attd. 4th Canadian Divisional H.Q., Canadian Infantry, died 7th April 1919. Croix de Guerre (Belgium). Son of Lt. Col. W. J. 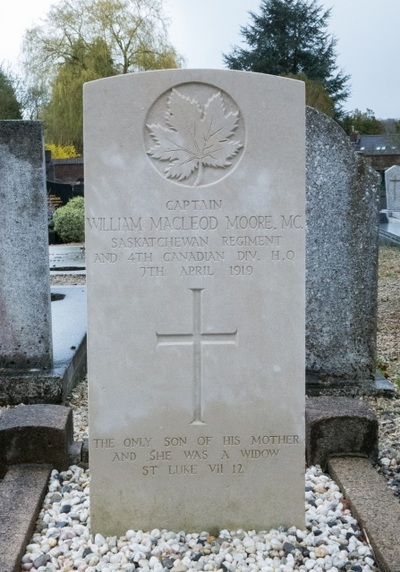 B. MacLeod Moore (late 69th Regt.) and Emily Susan MacLeod Moore, of Montreal, Canada. Joined Canadian Army April, 1915. Wounded Nov., 1916. 1467176 Gunner George James, 61 (The Denbighshire Yeomanry) Medium Regt. 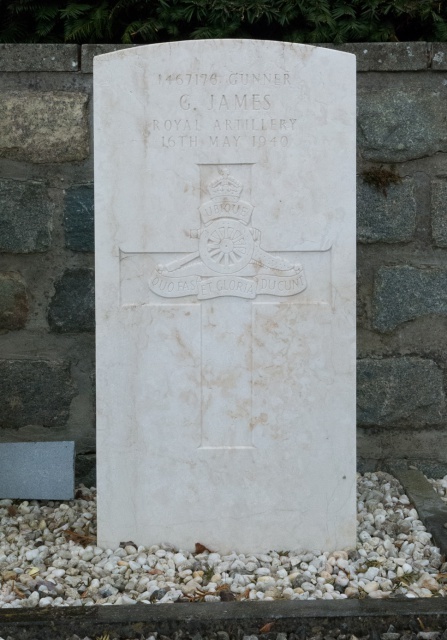 Royal Artillery, died 16th May 1940. 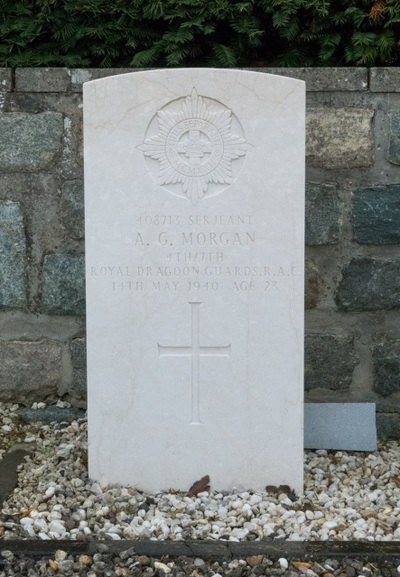 408713 Sergeant Alan George Morgan, 4th/7th Royal Dragoon Guards, Royal Armoured Corps, died 14th May 1940, aged 23. Son of David Ernest Morgan, and of Elsie Mary Morgan, of Penarth, Glamorgan.